This may have been part of Google's previous iPhone optimized announcement, but Google's Mobile Blog discusses the launch of the iPhone optimized version of Picasa, along with some screenshots. 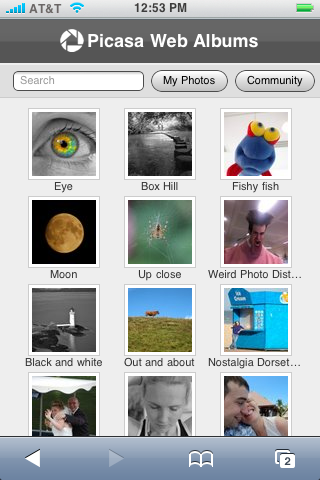 Today, I'm happy to tell you that we've just released this new iPhone interface for Picasa. After you go to Picasa on your iPhone and log in, you can quickly see all your albums that you've uploaded to Picasa Web. If you click on any of the albums, you can get a full view of your picture with comments from your friends. Or you can click on Slideshow, sit back and watch the pictures scroll. You can also search for photos in your album or through community photos. Finally, with one of my favorite features, you can view your friends' albums through favorites. Picasa is Google's photo sharing web application with support for Mac and Windows.